The historical city centre, Chaikovsky lane. The second floor of the old building. Next Opera, Potemkin staircase, Deribasovskaya str, cozy cafes and shops. Windows overlook the quiet, cozy yard with a modern design. There is parking in the courtyard and one of the best fitness centres of Europe FORMULA. Comfortable apartment of the total area 46 sq. m. Includes kitchen Studio with pull out couch, armchairs and separate with double bed. The apartment is equipped with air conditioning, kettle, telephone, cable TV and high-speed Wi-Fi Internet. Has a modern shower. 3-th floor of the nine-storey building Shahnome. The House is built in Mauritanian style and impressive its exotics. Historical center of the city, next to the Ekaterinenskoj area/reg. deribasovskaya and Primorsky Boulevard on the 3 floor of the nine-storey building. The House is built in Mauritanian style and impressive its exotics. 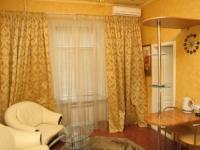 Luxury apartment, author's design, modern, cosy surroundings, two air conditioners, plasma TV, Jacuzzi and high-speed Internet. A comfortable apartment of the total area 65 sq.m, 2 double bed, modern sofa, beautiful lighting, kitchen-Studio, author's design, High-speed Wi-Fi Internet.